OVERSIZED SHELVES, PLANTERS AND TRELLISES can be created for any season with any design theme. Celebrating Fall is fun with this little gardener and her friends. This shelf can be quickly installed on a wall indoors or out, and would be a playful addition to a front porch or entry. Place miniature pumpkins and candles for a delightful Autumn display! CANDLE TRELLISES are a playful way to burn soft flickering candles in glass holders. In Summer, Fall, Spring and Winter, it is easy to create a decorator touch to an intimate area of patio or home. Designed for installation on a wooden fence, this steelwork can be part of an exterior wall in a patio setting. This can remain outdoors all year without damaging effects. 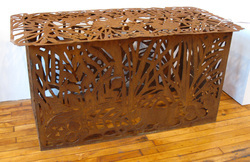 "Celebrate What You Got" utilizes the cut-outs from previous plasma cut projects. Welded onto a steel rod armature this 6 foot tall female figure develops layers of interesting shapes. Not idealized at all, this wall sculpture explores the forms of an aging person who wakes up every morning and is excited to be alive to celebrate life! 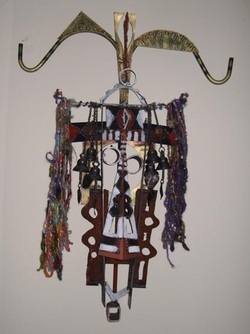 Utilizing SCRAPS to create masks that recall the ones I have seen in my visits to Africa and China offers an opportunity for extreme creativity. This mask has hand crafted bells from Nepal. Works like this can be created utilizing your objects as well. CUSTOM WORKS can be commissioned for any structure and finish. 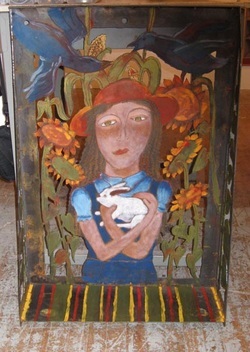 This outdoor garden table features images of bunnies, hosta and creatures found in any garden. Left to rust naturally, these works remain in the elements year round.